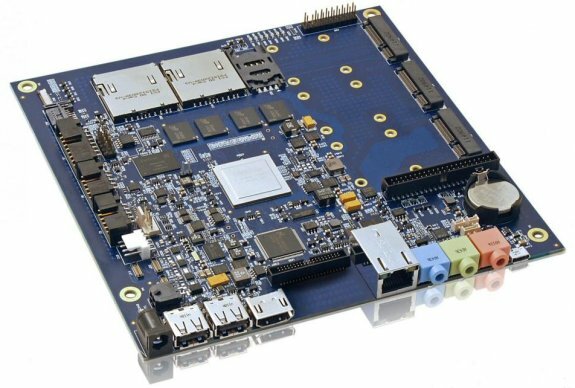 TPU reports Kontron has developed the KTT30/mITX, a new 170mm x 170mm Mini-ITX motherboard that's based around NVIDIA's Tegra 3 SoC. The board can run most distributions of Linux for ARM (including Android and Chrome OS) and should be capable of running Microsoft's upcoming Windows 8 RT. The GPU is fit to drive 1080p displays with H264 MPEG-4 encoding/decoding acceleration. Display outputs include HDMI 1.4a (up to 1920x1080 pixels), and LVDS 24-bit (up to 2048x1536 pixel @ 18bpp). The Kontron KTT30/mITX packs 2 GB of DDR3L memory. For storage, it has an mSATA 3 Gb/s port, two SD card slots, and a bootable eMMC slot. Two mPCIe slots and a SIM card slot (for 3G HSDPA) handle on-board expansion. System interfaces include two RS232 (serial/COM), three USB 2.0. Apart from 3G HSDPA, the board supports gigabit Ethernet. For audio, there's 2-channel analog and multi-channel digital (S/PDIF) audio outputs. The board draws power from a 2-pin DC input.